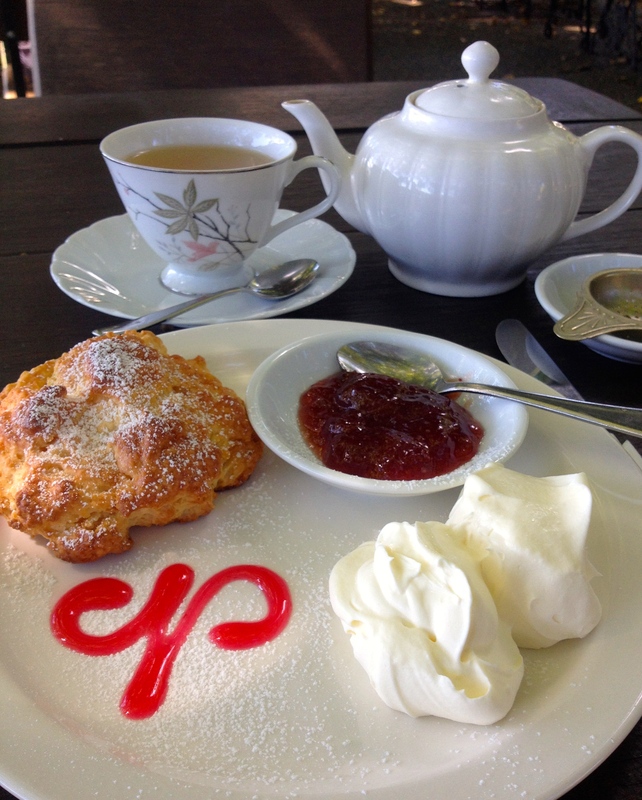 Moorland Cottage in tiny Moorland, a kilometre off the Pacific Highway, claims that they have the best scones on the coast. That’s a big call, as it’s a long coastline, but after my recent visit, I might have to agree with them. You could say that Moorland Cottage is a bit of a destination, not in the Disneyland sense, but it’s a lovely place to fuel up on food while at the same time taking a break from the bitumen. Relax in the shady garden, where tables are topped with ‘tea potted plants,’ or take a table inside and pick up a memento from the goodies for sale. It’s warm and inviting with myriad teaware, soaps, relishes and jams to buy. Their scones are seriously sensational. The day I drop in, plain and date scones have just come out of the oven (I arrive mid morning). They are light and fluffy with a slightly crisp outer layer, and the date scones are rich and moist without being too overpowering with the dates. The rich mixed berry jam, that tastes more like raspberry jam is house made, and the cream is whipped as thick as possible. Moorland Cottage is a gem for road trippers, although shame about the ordinary tea bag. 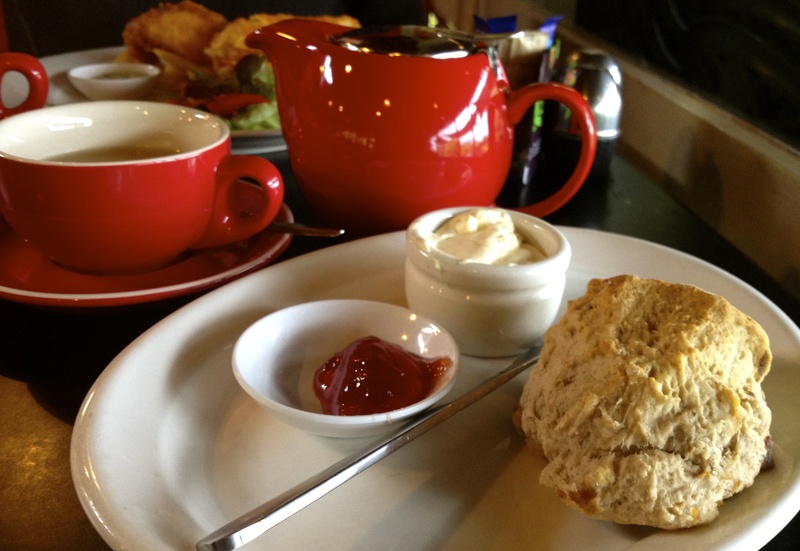 With some loose-leaf tea, this Devonshire Tea could be one of the attractions/highlights of any Pacific Highway road trip. I know where I’m stopping next time! Conveniently open seven days a week from 9am until 4pm. Tea: A selection of tea bags (mine was an ALDI Diplomat tea bag) served in a good-sized pot. Overall: A ‘not-to-be-missed’ Pacific Highway ‘must-do’. I don’t remember Bulahdelah looking so slick. I swear the town is looking better every time I visit, which is random and not very often. It’s abuzz with travellers stopping to stretch legs and grab a bite to eat. With several cafes to choose from as well as the pub by the river, I can understand why it’s so popular. 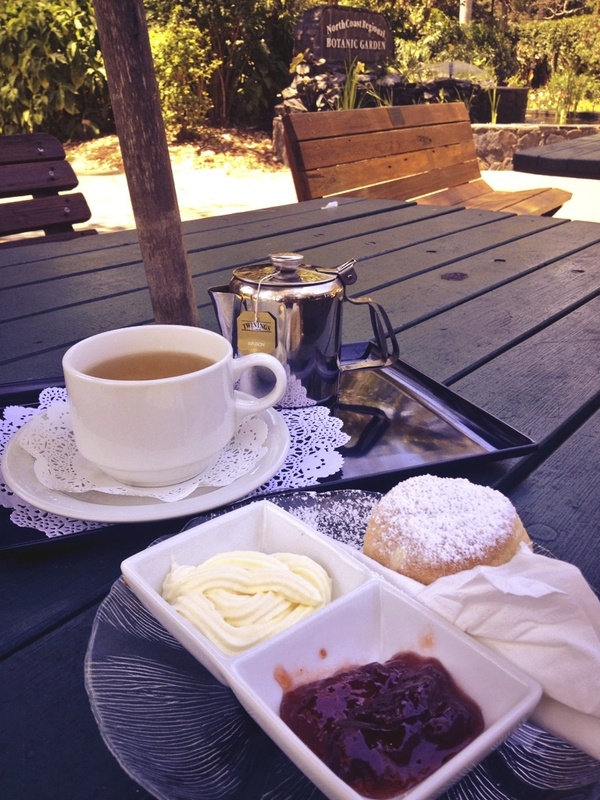 I’ve only got time for one Devonshire Tea so I choose the attractive Myalla Magic that is in fact a handsomely renovated timber house with a verandah and shady garden out the front. The interior rooms have been kept intact as to give it a cosy vibe, and privacy if you have a big group and want to take over a room. It’s a warm day so I sit out on the shady verandah that wraps around part of the front of the building. Tasty and fresh date scones are on the menu today: crispy on the outside with a perfect soft texture on the inside. 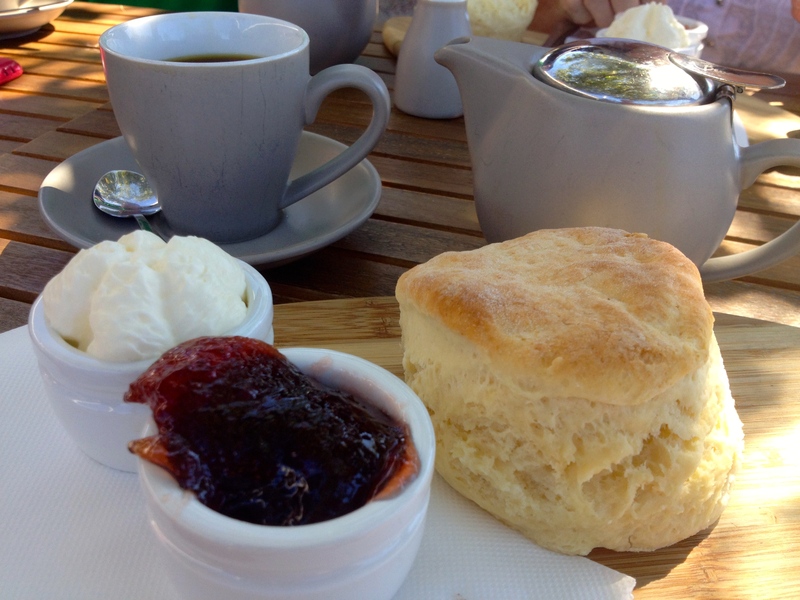 The jam and cream are quite average, and the cream is so light (it’s a hot day) that it melts before settling on the scone. If you need a break, Bulahdelah is the place! Tea: A selection of teabags served in a small pot. Overall: Gorgeous renovated timber house with a lovely garden. 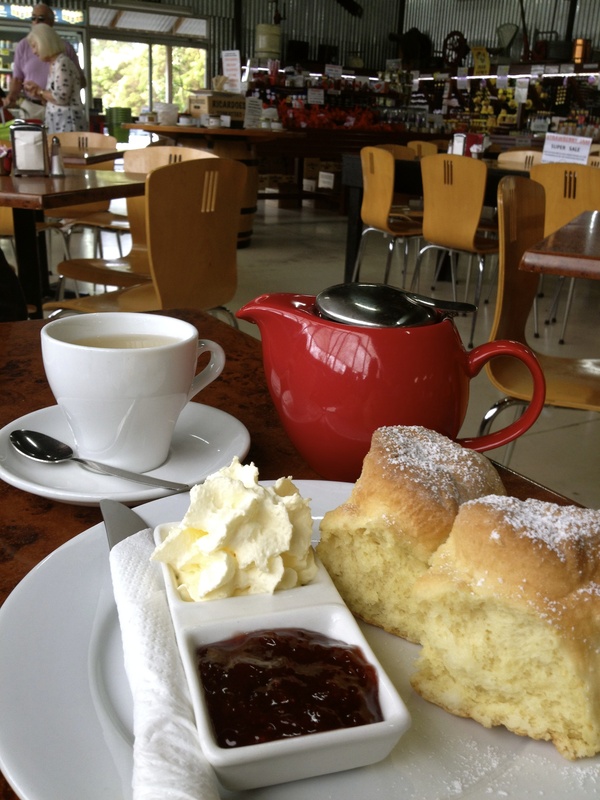 The Taree Craft Centre Inc. and Cottage Cafe are humming the day I visit. It’s the eve of their Quilting Exhibition and crafters are busily moving furniture and hanging quilts. Not a fan of craft, but I do love the odd tea cosy, particularly from a functional point of view. An owner of 20 varieties of tea, I’m always nursing pots of tea throughout the day, so a tea cosy comes in handy during winter. The Craft Centre not only sells crafty wares and trinkets but is a hub for folks to learn skills in knitting, crocheting, patchwork and quilting, scrapbooking and jewellery making. 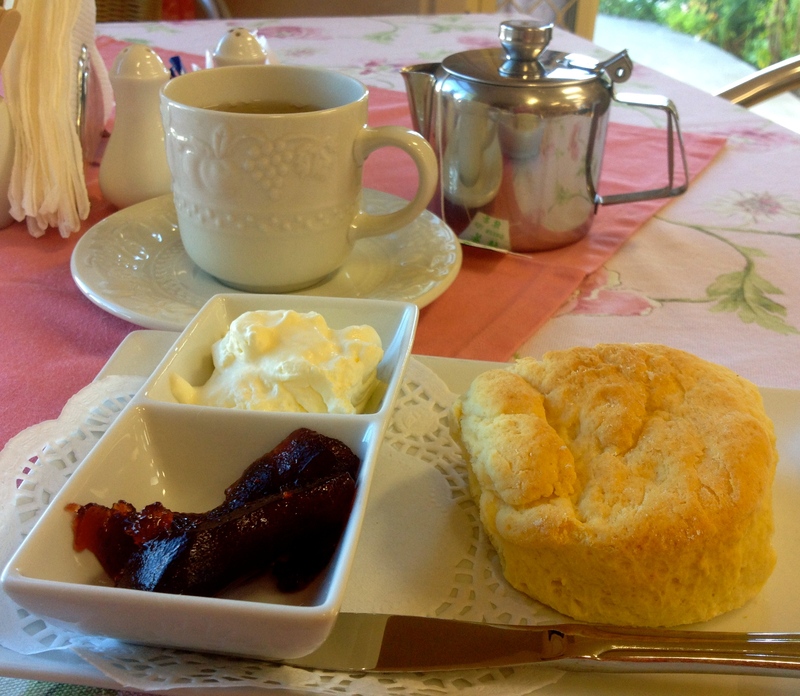 The Cottage Cafe offers a simple menu including plain or date scones served with butter. The scones taste homemade with a lovely texture but are microwaved a bit too much. The jam is thick, reminiscent of canned varieties, which I like, and the cream is fresh and thickly whipped, as it should be. The café opens Monday to Friday from 9.30am to 2pm. Tea: A variety of tea bag teas served in a small pot. Overall: An extensive craft shop with a comfy café that craft lovers would love. Unless you know where it is, or you’re good at making split second decisions while driving at 100km/per hour, The Other Side Gallery Teahouse may elude you. Set off the Pacific Highway just north of Taree, the Teahouse sits alone on a property in Ghinni Ghinni (I must admit it is the first time I have heard of this village). It’s a prime spot, perched right beside the river where you can dine alfresco in the shady garden, or in inclement weather on the back deck or amongst the art inside. While you’re waiting, browse the artwork by local artists, or book in for an art class. The dessert cabinet is loaded with delicious looking homemade goodies (I am a fan of the homemade), and there is a motley collection of dainty teacups and saucers ready and waiting on the counter. Tea always tastes better drunk from a china cup, don’t you think? My scones arrive on a pretty vintage plate, but are slightly burnt on the bottom, definitely affecting the texture and flavour. On the positive the topside tastes good and is fairly light and fluffy, and although its fresh cream, it’s a bit too light for me. The Teahouse is open briefly on Thursdays then from Friday to Sunday. Tea: A variety of loose-leaf teas, including T2 and other brands served in a small pot. The special tea of the day is a Blue Mountain black tea. Overall: An art and tea break in the most unlikely of places. Considered the grandest house in Kempsey, Netherby House B&B is a 1922 heritage art deco house offering four guest rooms overlooking the Macleay River. I’d like to say it’s a peaceful location, but the traffic roaring across the bridge to and from the town centre is hard to ignore. What stands out is the alfresco dining in a shady garden overlooking the river and that noisy bridge, which, on a sunny day is glorious. Although I’m only passing through, I wish I had the time to spend several hours reading or writing, as its a lovely place. The scones aren’t your average and mine arrives looking flat, not pancake flat, but shaped more like a rock cake. It has an unusual flavour and is similar to a muffin in texture once pulled apart. Bonus points for being fresh, and the presentation is impressive – is that a ‘N’ for Netherby House on my plate? 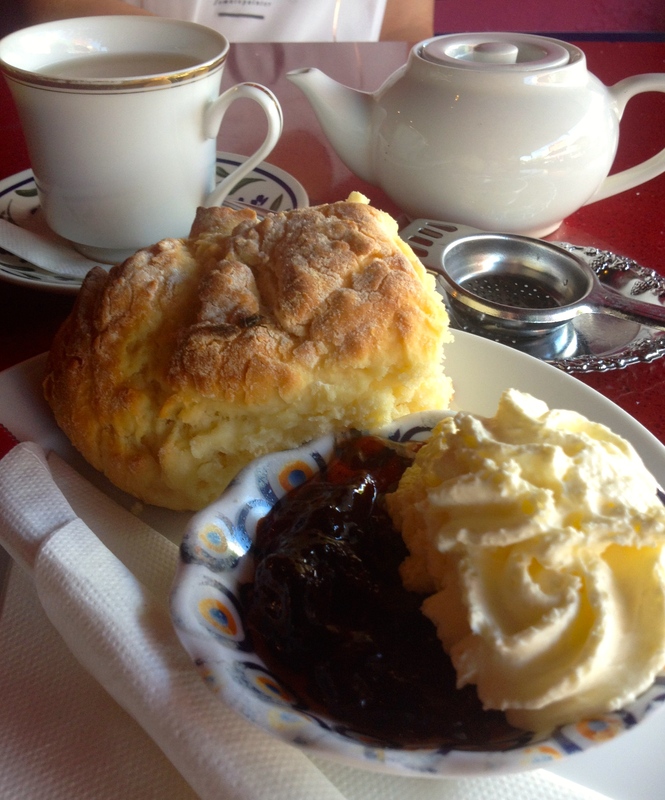 I still can’t understand why scones are served with such disproportionate amounts of jam and cream. This one has about four times the amount of cream – weird. The jam is a let down, a low quality and sickly sweet strawberry, although the cream is so thick I ask, “What’s the secret?” The cream reminds me of my childhood when I had a dollop of Nestle can cream on hot chocolate custard (you can still buy this cream, it’s near the sweetened condensed milk). I’m right; this is cream from a can and whipped for extra thickness. Touché! Closed Mondays. Tea: A good selection of black and herbal loose-leaf teas served in a good-sized pot. Overall: Although a diversion from the Pacific Highway, the riverside location is sublime. More restaurant than beach kiosk, Trial Bay Kiosk is smack bang in the middle of Arakoon National Park and beautiful South West Rocks. If you’re camping, it’s a lovely and convenient spot to hang out on the timber deck. Looking over one of the National Park’s campgrounds, the view of Trial Bay is in the distance rather than on its doorstep. Just down the road is the historic Trial Bay Goal, which is well worth a visit, if not for the history, for its position on the headland. The sweeping white sand beaches are a big draw card, as is the top dive site, Fish Rock Cave. The Kiosk’s kitchen closes at 2pm, so don’t leave a visit too late. 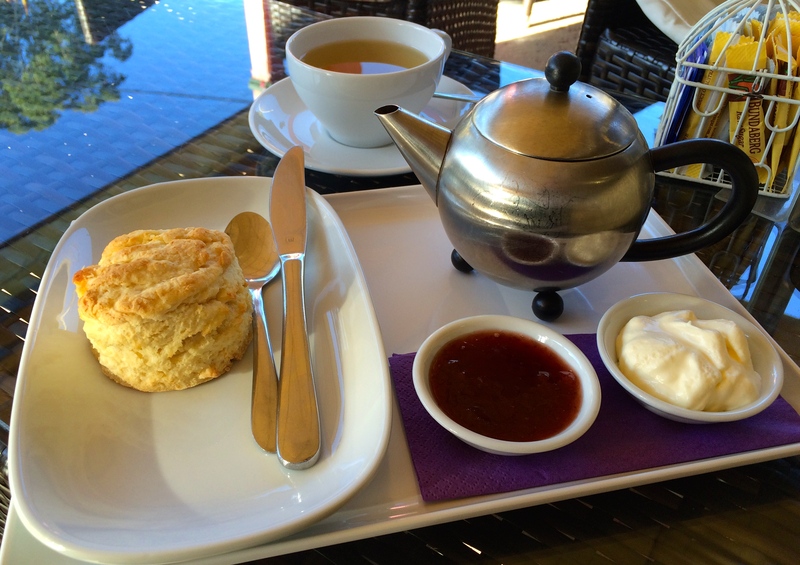 There is date and plain scones on the menu, and the day I visit, my scone was made to order. Very fresh, a definite homemade texture and straight from the oven, what could be better than that? The small serving of jam is a bit frugal and the cream, although freshly whipped, errs on the light side. Tea: A variety of Lipton teabags served in a pot. Overall: A convenient cafe when you get sick of camp food. It’s a warm and sunny autumnal day in Woolgoolga, an easy 10-minute drive north of Coffs Harbour. I’m told by friends who have just moved to town, that apparently the Coffs Harbour region have the best overall weather in Australia; not too hot, not too cold, but just right! Today it feels perfect, glorious even. This is my first time in the town proper. My only past recollections of Woolgoolga are a roundabout, a statue of an elephant and an exotic looking temple. I am told they are still here, but you don’t see them since the recently opened section of the Pacific Highway, which bypasses that very roundabout. When I venture to the beach and a look around town I am surprised at how populated and bustling it is. A Woolworths is about to open and cafes are doing a roaring trade, and Bluebottles Brasserie is one of them. My scone arrives on a breadboard, which is very sophisticated. The scone is on the dry side so I am appreciative of the generous amount of jam and cream to mask its averageness. The thick jam and whipped cream, that could be a bit thicker, isn’t bad and it’s a fine option just to soak up the climate. Woolgoolga is definitely worth a stop if you need a break from the Pacific Highway and to get away from the madness of Coffs. Tea: A selection of loose-leaf teas served in a standard-sized pot. Overall: A pleasant café in a chilled out mid-coast town. I haven’t stopped at The Big Banana in Coffs Harbour since 1986, as I always seem to be passing Coffs Harbour in the air these days. I’d like to say that nothing has changed, but I would be lying. But, things always seem different when you were younger, weren’t there a lot more banana trees back then? Nowadays The Big Banana is a fun park; a toboggan ride, waterslides, there’s even an ice skating rink, and of course a huge gift shop. Yes, they still sell choc-coated frozen bananas, and people still pose for photographs in front of the big bright yellow banana, but it’s just not the same. The Going Bananas Cafe is geared to families, and in saying that I mean kids. As I stand at the counter to order my scones, I spy my scones in the cake cabinet and know it wasn’t going to be pretty. They are on the dry side and slightly anemic, with the jam and cream arriving in small plastic tubs. Not one for wasting food, after a couple of mouthfuls, I must admit, they went into the bin. Tea: A small variety of tea bags. Overall: Give the cafe a miss unless you’re hanging for a choc-coated frozen banana. Just 25 minutes from Coffs Harbour and a pretty drive south from Grafton, Nana Glen is Russell Crowe territory – although there’s absolutely nothing in the village that alludes to this fact. Idle in Cafe is the first, and I think only cafe I see in the village, but maybe the stunning countryside has mesmerised me so much that I fail to notice? Inside its pleasantly air-conditioned, but if you like to feel the heat sit out front under the shady awning or in the courtyard under the umbrellas. While ordering my Devonshire Tea, I can’t peel my eyes away from all the homemade goodies in the cake cabinet, already making a mental note of everything I’d like to try when I next pass by. I order only one scone, and yes it is indeed ‘the best homemade scone in town’, although as mentioned earlier, I don’t recall seeing another cafe. The cream is a tad too light for me, but otherwise, idle on in to Nana Glen for some chill out time. Tea: Several varieties of loose-leaf tea. Overall: A friendly relaxed cafe in a sleepy village. 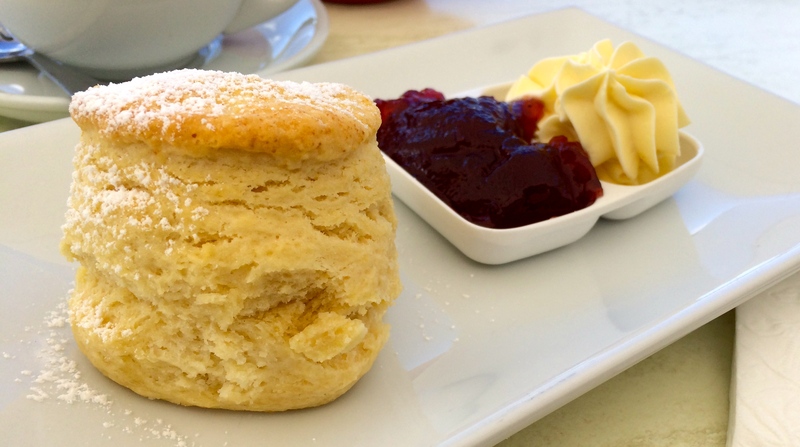 Opened from Tuesday to Friday between 10.30am and 2.30pm, The Garden Cafe is the ideal spot for scones after a wander through the tranquil Botanic Gardens in Coffs Harbour. The cafe is run by volunteers, hence the limited opening times, and is a friendly place to spend time in the shady seating area in the warmer months or the more shielded semi indoor area in the winter (not that winter gets too cold on the mid north coast!). It’s cheap as chips and comes with one scone and a small pot of tea. The dusting of icing sugar gives a nice sweet hit to a perfectly baked light fluffy scone. 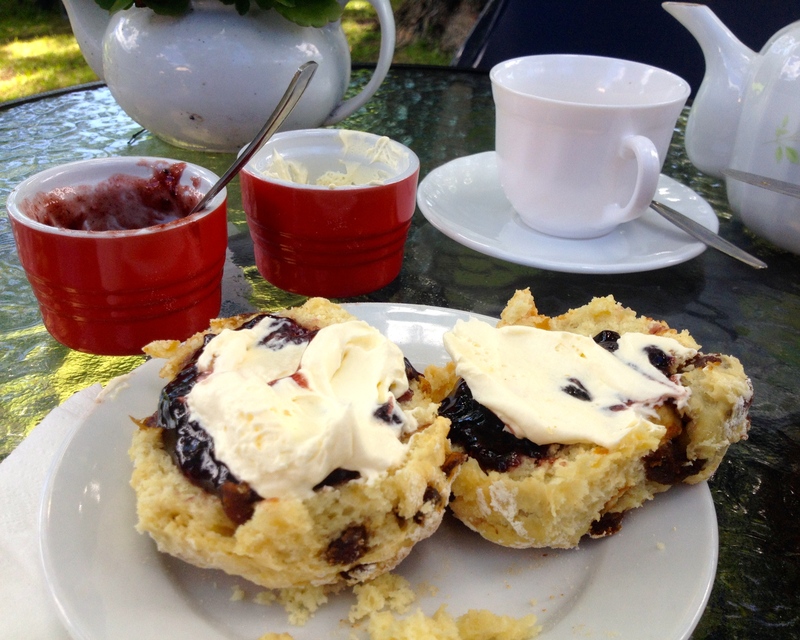 The scone is so delicious that not even the average jam and the very light cream can spoil it! 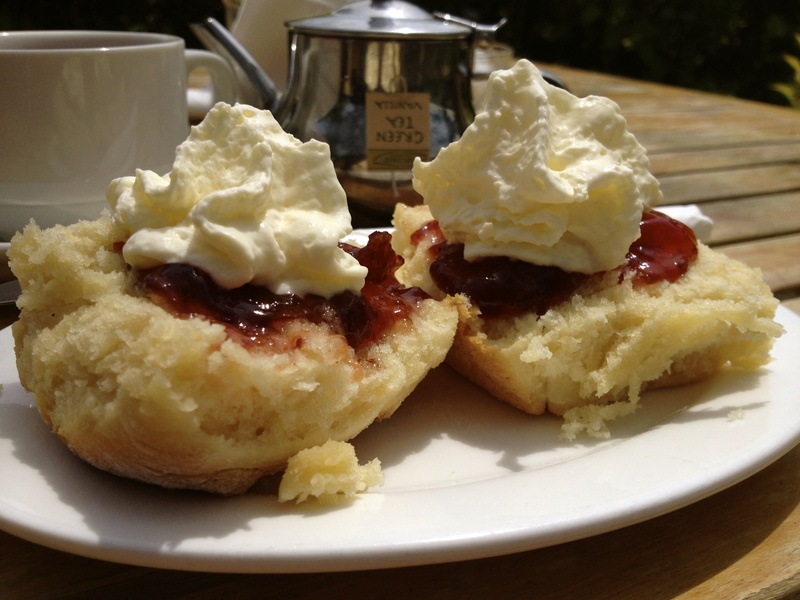 And best of all, enjoy your Devonshire Tea knowing that all proceeds go towards the maintenance of the gardens. Tea: A variety of tea bags. Overall: What’s not to like about a Botanic Garden? Although only a ten or so minutes drive from downtown Port Macquarie, the Abundance Lifestyle and Garden feels a world away. Essentially a garden centre with a restaurant/café overlooking a duck filled lake, I’m not sure how much plant perusing is going on. After a few minutes lakeside, it’s seriously difficult to tear yourself away from the chilled ambience. Whatever daytime meal you are after, the drawcard is definitely the splendid surrounds. Since I’m dining alone and on a scone bender, I go for the half serve, i.e. one scone rather than two. Heading down the traditional pathway, I order the plain, although the date scone looks tempting. The plain impresses with its creamy fluffiness, and the jam, although nothing flash, is thick and firm and has substance to it. I am seeing a theme in this region in regards to the cream. Yet another café serving cream from a whipped cream dispenser with a fancy nozzle, chilled and firm. Nice one! Tea: A small selection of loose-leaf teas served in a good-sized pot. Overall: The sublime lake view is worth an extended visit. Just north of Port Macquarie, a turn off the Pacific Highway takes you to Ricardoes Tomatoes & Strawberries, a popular grower of – yes – you guessed it, tomatoes and strawberries. You can’t miss the two acres of huge greenhouses that are used to grow these red babies, and the tin shed, which doubles as a packing shed and shop/cafe. Browse and taste jams and relishes made from said items, plus anything else visitors may want to buy, like fresh produce, eggs, chocolates etc. Grab a bucket and pick your own strawberries. Cafe Red serves lunch until about 2 or 2.30pm, after that, it’s just afternoon tea. The blackboard menu says that there are plain and pumpkin scones, but when I order, I am not offered the choice and forget to ask. I’ve got to say the scones aren’t particularly tasty, with insufficient jam served to boost the flavour. Of course the jam is better than average, but not as good as you would expect at a strawberry farm. The cream is fresh, but very lightly whipped. A pleasant diversion for anyone who wants to buy fresh tomatoes and strawberries. Tea: A variety of loose-leaf teas served in a good-sized pot. 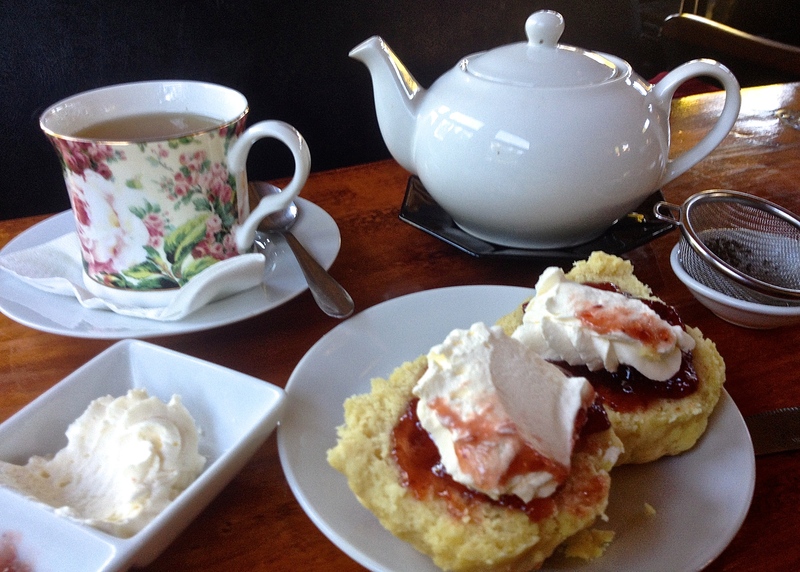 Try the strawberries and cream tea. Overall: Stop if you want to buy fresh produce or do a farm tour. By the sounds of the tooting from the steam train somewhere in the bush across the road, Timbertown is still open for business. In this fickle world it’s nice to know that simple entertainment is still thriving. Curly’s Cafe resides in a shack that looks like it belongs in Timbertown. It’s cabin-like cosiness on the inside, contrasts with the space available to spread your wings in the back courtyard or in the front garden. While in the queue to place my order, I have time to dither over which Tea Drop tea to have. There are plain and date scones, which are big and wholesome (read – dense), so just get the one, unless you are starving hungry. Unfortunately there’s not enough of the housemade jam (too runny), which is more syrup than a spread. I actually wince when I see a ginormous cream piping bag; obviously filled with whipped cream, go into the fridge. In my confusion I mix it up with a whipped cream siphon, which spits out cotton wool soft cream (not my most favourite), but instead I get a pretty bowl of thick and firm whipped cream, heaven – sigh. The highlight is the range of Melbourne outfit, Tea Drop teas (one of my favourite brands). The lowlight is that the high quality tea bag is dunked in a shallow coffee cup of hot water, sacrilegious. An additional pot of hot water is an extra dollar on top of the $3.60 cup of tea – eek! Tea: A more than most extensive range of Tea Drop silk tea bags served, ahem, in a small coffee cup (no tea-pot). Overall: A cosy ‘shack vibe’ that’s handy for a visit to Timbertown. 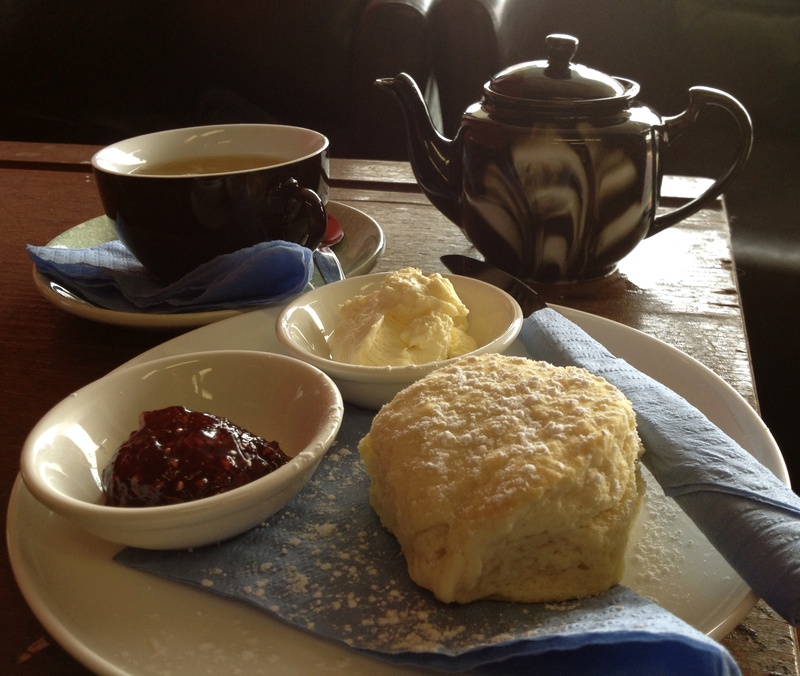 South of Port Macquarie and a short diversion from the Pacific Highway, you’ll find mid north coast hospitality and a pretty place to chill in historic Kendall at Miss Nellie’s Cafe. After a quick look around town, it isn’t too big; settle in at the cafe for some chill time. Depending on the weather there are three seating options; out the front under the awning, in a semi open side annex attached to the side of the main building, and inside, the heart of all the action. On the menu are both half and full serves so you can order according to your appetite. 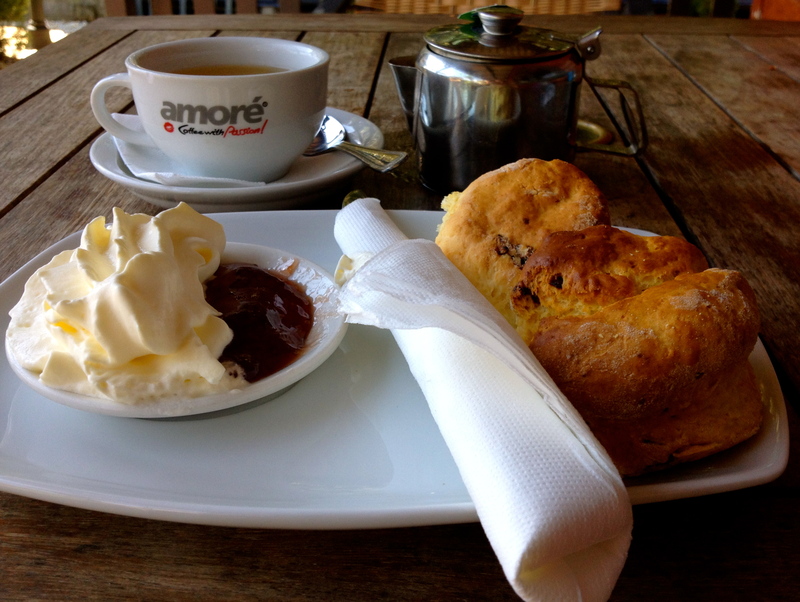 The plain scones are just like you would expect from your nanna; soft and fluffy – all melt-in-your-mouth goodness. The homemade strawberry jam is a bit runny, and because I am sitting in a lounge chair and not at a table, I manage to drip some down the front of me. The cream is fresh and whipped but needs to hit the fridge for a bit. When you can finally tear yourself away from the serenity, check out the local goodies that they have for sale. Tea: A small range of World Par-TEA loose-leaf teas served in a smallish pot. Overall: A cute café in a quiet heritage town. Port Macquarie is blessed with a spectacular coastline and enough stunning beaches interspersed between rocky headlands to keep visitors and locals enthralled for an entire visit or a lifetime! Flynn’s Beach, which is just a few scenic kilometres south of the centre of town, is easily accessible by car (down the hill), by the stairs, or along the coastal path. The beach is divine, and we see dolphins frollicking out past the breakers. You can’t miss Purnos On The Beach as it’s right on the walkway, which splits the kiosk servery from the dining annexe. The first thing I notice about the café, apart from its ocean dipping proximity, is the ‘we don’t serve hot chips’ sign. The owner certainly has a sense of humour, because ‘hot chips’ are what you’d expect from a beach kiosk in a coastal NSW town. After that sign, I shouldn’t be surprised when I spot the scones on the menu. It’s kind of a contradiction though. They don’t serve hot chips, but serve the tea in a takeaway cup even though I am sitting down to scones on a proper plate. The jam and cream also comes in plastic containers, which feels a tad on the ‘cheap’ side. It is a beach-like kiosk after all, so why should I complain as I sit at a picnic bench in the sun (one of two near the café)? The scones are slightly sweet, which could be due to the dusting of icing sugar, but are freshly baked this morning. The jam is cheap and syrupy sweet and the cream super light, adding to the already sweet spread. 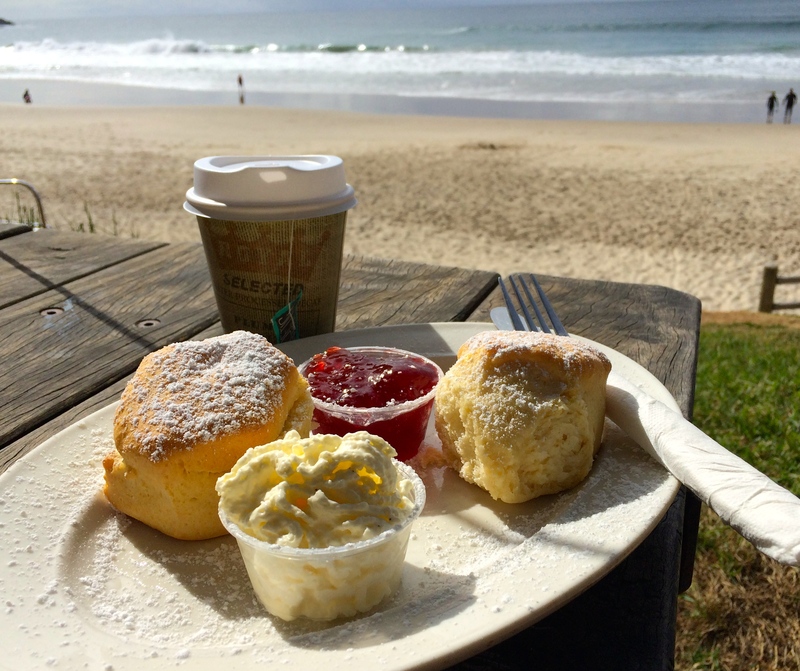 But a Devonshire Tea with a beachside view? You just can’t beat that! Tea: A very ordinary choice of tea bags served in a small or large take-away cup. Overall: An amazing location just metres from the sand. Along the coast, south of Port Macquarie’s Town Beach and along the coastal walk, Sea Acres National Park is a pocket of rainforest easily accessible to visitors. Featuring the Sea Acres Centre, which is essentially a visitor’s centre, a gift shop selling stuffed toy cockatoos and lemon myrtle soaps and the like, and the start of the Rainforest Boardwalk (fees apply). Take a Discovery Tour with National Park’s and Wildlife staff along the boardwalk and learn about Aboriginal bush tucker and the history of the Sea Acres area as you wander through the dense canopy. Otherwise, stroll at your own pace and enjoy the serenity of the sounds of nature. Also accessed through the gift shop is the Rainforest Café and access to the outside eating area on the open deck is only through the café. The rainforest canopy shades the deck so there’s no need for a roof and the café itself is made of endless glass to allow as much natural light in, which is tough considering the towering trees and thick foliage. Although a no-brainer for me, my friends find it tough to choose from the extensive ‘sweets’ menu. I’m happy to see the humble Devonshire Tea make it up on to the board and that the fluffy scones coming out of the kitchen are homemade, and just the right size for a snack. The jam is fairly average and the whipped cream chilled and firm – I just wish there was more of it. Tea: A selection of organic loose-leaf teas served in a small pot. Overall: Dine under the shady canopy to the backdrop of rainforest bird life. It’s not just the attractive art that attracts the hordes of visitors to the Tweed Regional Gallery and Margaret Olley Art Centre in South Murwillumbah. I think it also has something to do with the large picture windows in the foyer that are a piece of art and offer sweeping views of the Tweed Valley towards Mt. Warning. Serendipitously these views are the same that diners at The Gallery Cafe have, which is probably why you need to book a table at lunchtime. Run by the boys from Mavis’s Kitchen in Uki, the Devonshire Tea spread is almost identical to what you can get at Mavis’s. The hearty scones are large and good for sharing (unless you are really hungry), although they could do with more jam and cream. They’re fresh and slightly crispy and pair well with Mavis’s Kitchen’s organic paw paw/pineapple/ginger jam. The jam is an unusual combination but a refreshing change, although I can’t really taste one distinct flavour. The cream is freshly whipped but a bit too light. The real winner here is that magical view! Tea: A variety of organic loose-leaf teas served in a small teapot. 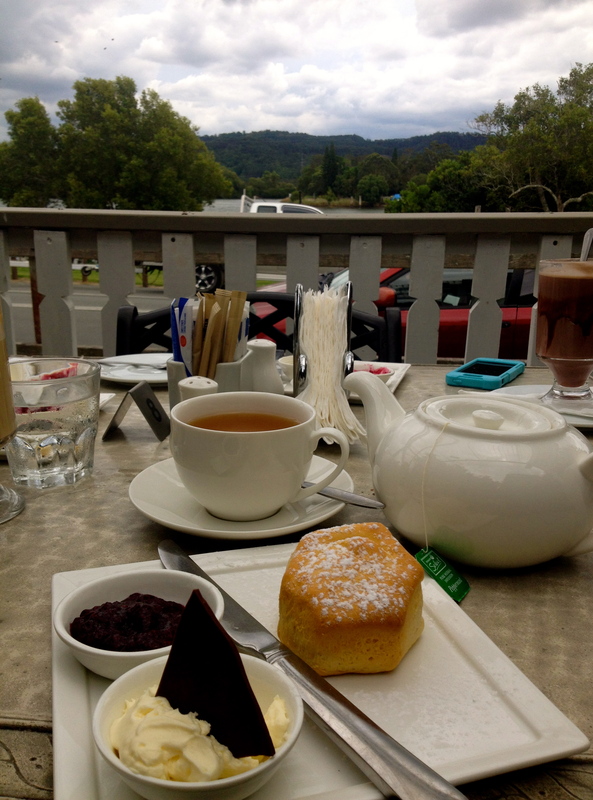 Overall: A very busy café with sensational views of the Tweed Valley. The House of Gabriel may tower over the few businesses in tiny Tumbulgum with its grandeur, but further down the road and still offering the same magnificent views of the Tweed River and beyond, the Birdwing Cafe & Curios does things its own quirky way. Slightly tucked away, look for the handful of tables, the cosy café in an old timber house has a real welcome and warmth to it. It’s so relaxing I want to doze off in one of their comfy chairs to the backdrop of classical music playing in the background. Check out the plaque marking the river levels of the 1954 floods on the front steps as you enter the café. 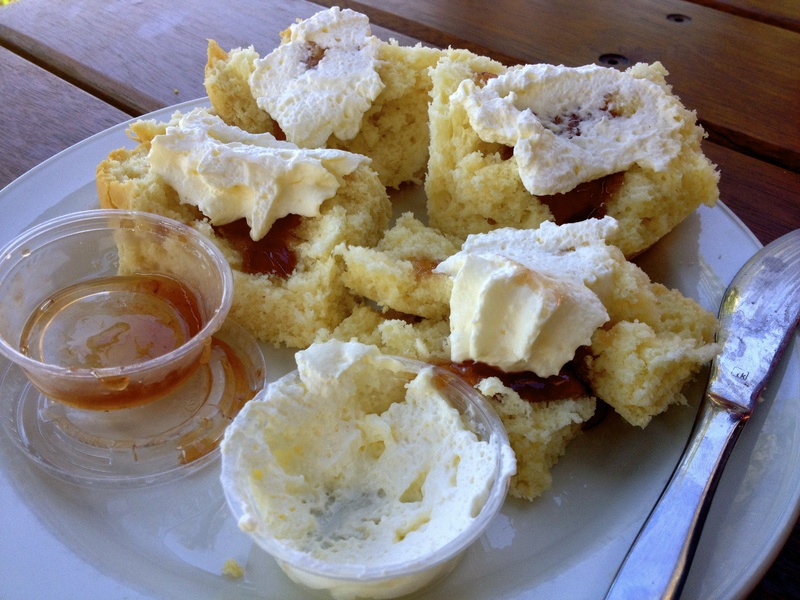 The menu is loaded with homestyle dishes including the homemade scones. They’re a little burnt on the bottom and being heated up in the microwave has robbed my scone of any flavour. The raspberry jam is thick and firm, not bad for an average brand, and the cream is thickly whipped. Love the fine bone China trio set and tea strainer – very, la di da! Have a good look around before you leave, as there are all kinds of things in dusty corners for sale, including art, new and used books, and a mini nursery around the back – if you are after a souvenir pot plant or Buddha statue. Tea: A small range of Madura loose-leaf teas served in a generous teapot. Overall: A quirky and cosy vibe with sensational views across the Tweed River. It’s easy to miss Tumbulgum, not only is it now bypassed by the new Pacific Highway, the historic village is also a short diversion off the Coolongatta to Murwillumbah road. But as soon as we see the House of Gabriel up ahead there’s a collective sigh of excitement in the car, and we’re glad we’ve made the effort. The imposing 100-year-old building houses a responsibly priced gift shop which doubles up as an art gallery, and Cafe Gabby. Most tables in the gorgeous semi covered pretty courtyard and verandah offer extensive views toward lush green hills and the Tweed River flows by out front. The place is a big hit with my friends, with one even asking whether she could buy the homemade forest berry jam because it’s so unique. The scones are fresh and crispy on the outside and just the right size for a snack. The cream arrives looking very impressive; thickly whipped with a shard of dark chocolate to add a twist of difference. Tea: Woolworths tea bags stored in Madura Tea tins, served in a good-sized pot. Overall: A surprisingly superb find. South of the NSW/QLD border are the pretty beaches of Kingscliff and enough shops, restaurants and cafes along the beach side strip to keep visitors amused. The low-key seaside resort doesn’t have the va va voom of Byron Bay, but is worth a look in if meandering up or down the NSW north coast. The cafes along Marine Parade spill out onto the footpath with most having alfresco dining to take advantage of the beach vibe. The day I pass Cafe Zingara, I spot a bunch of flowerpot scones sitting on the counter. Looking more like a muffin than a scone, there’s plain or date to choose from, and although they look rather large, they are actually quite small. My date scone tastes more muffin than scone and is a tad too microwaved and chewy with an over nuked flavour. There’s nothing special about the strawberry jam, but the cream, although sweet, is thickly whipped. Tea: A small variety of Madura loose-leaf teas served in a small teapot. 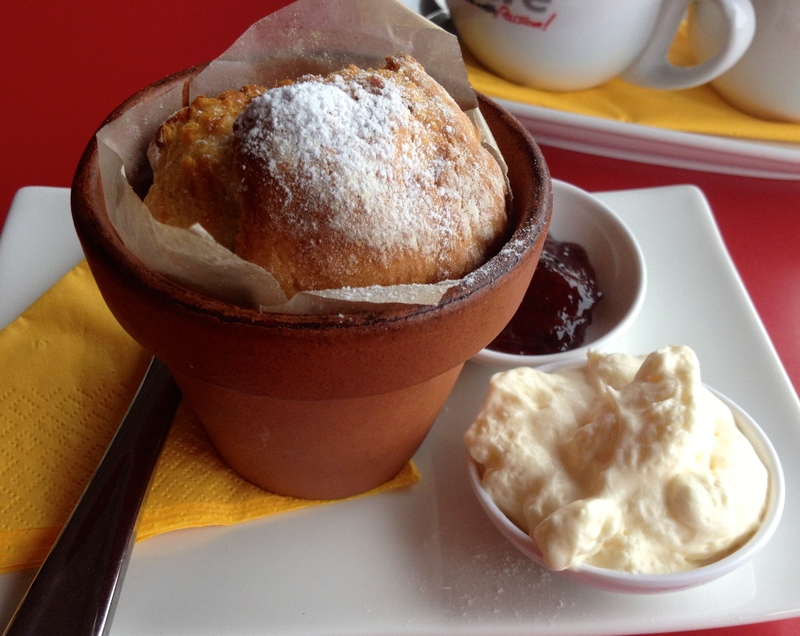 Overall: A pleasant alfresco dining option, and where else can you eat a flowerpot scone by the beach? You can’t miss Flamingo’s Cafe on the main street of Murwillumbah. The huge blackboard sign on the footpath advertises their homemade scones and is a surefire way of attracting scone lovers. The pink interiors and little flamingo statues outside are a nice touch too. The weather is balmy on the NSW north coast so take advantage of the outdoor seating. To be honest I didn’t expect much, but I am so surprised by the quality of the scone that I don’t even mind the average jam and cream. Brownie points to the tea cup and saucer, the better than average teapot and the lovely little strainer for the tea. 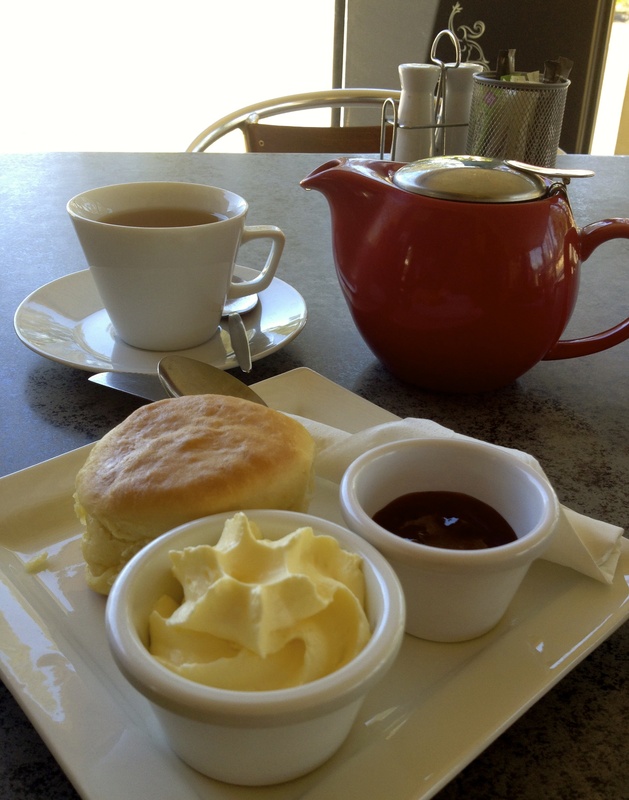 Overall: An unassuming café in downtown Murwillumbah. The majestic Mt Warning rises from the rainforests of the Wollumbin State Forest and looms over Mavis’s Kitchen. Day-trippers heading to hike the summit, pass by the gates of Mavis’s empire, which includes a restaurant, a Providore, kitchen gardens and a range of accommodation options set on a gorgeous lush tropical property. The restaurant is in a restored Queenslander style house, which offers lovely views and helps catch a breeze on summer days. A smart business is a successful one, and Mavis’s Kitchen is definitely that. Why? Hungry hikers, even if they have eaten their packed lunch, will always want to stop at a café for something decadent as a treat for spending hours hiking a mountain. It’s embedded into the human psyche. And this is where Mavis’s shows it’s business savvy, advertising their “Devonshire Teas” on their sign outside. No thinking by would be diners, “do they, or don’t they serve scones?” Just a, “let’s do it!” As I mentioned in an earlier post, these guys run the Art Gallery Cafe at the Tweed Gallery, if you thought I messed up my images. It’s basically the same spread but with a few differences. 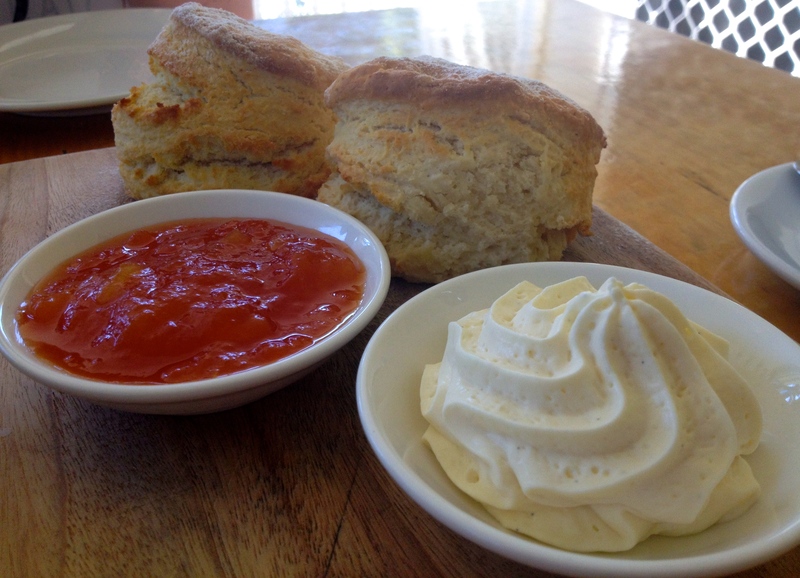 The presentation is much cooler as scones arrive on a breadboard – tre rustic! The homemade scones are hearty, perfect for hikers coming off the mountain, and the jam is the same organic paw paw/pineapple/ginger variety, although my friend and I feel that it is tastier, but is that possible? The difference is in the cream. The firm i.e. not too light Chantilly cream gives the scones an extra little kick of sweetness. 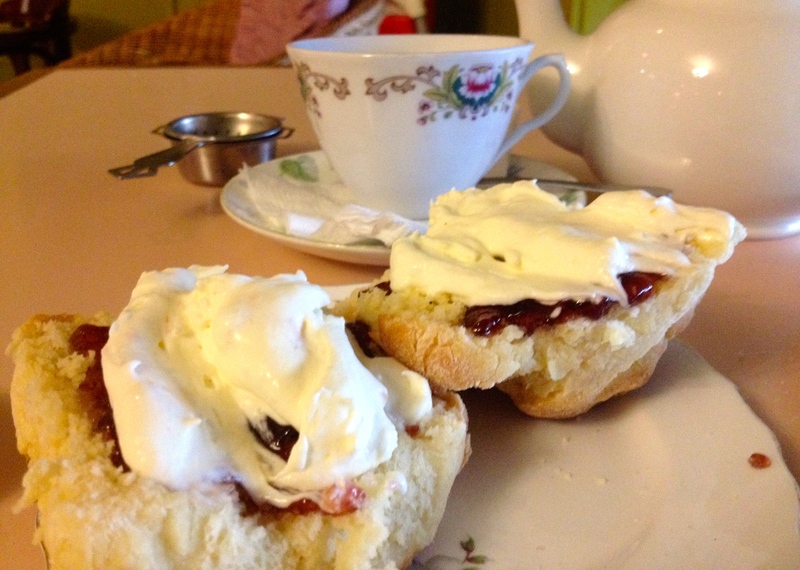 Open Wednesday to Sunday for lunch and of course Devonshire Teas! Overall: A beautiful location conveniently close to the Mt. Warning walking path. Broadwater could be one of those blink-and-you-miss-it towns that dot the old sections of the Pacific Highway. Except, sitting beside the mighty Richmond River is a sugarcane mill with a blinking big chimneystack bellowing out white fluffy plumes of steam (I hope) that is an endearing feature of the town. What’s cute is the hundred strong flock of cockatoos I see on the other side of the road cleaning up whatever of the sugarcane (I’m guessing) that doesn’t make the conveyor belt into the mill. It all sounds so quaint and 20th century – because it is! 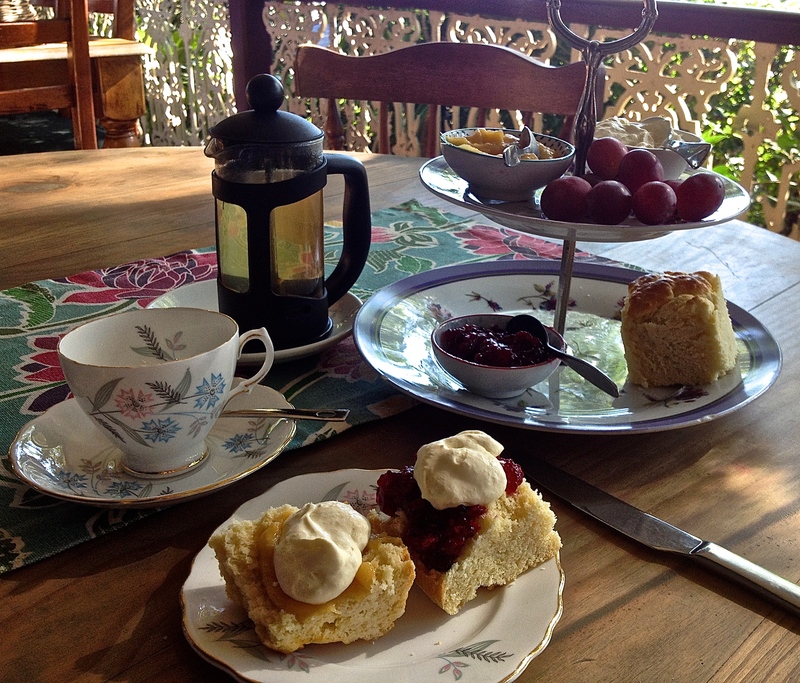 Right on the highway is Melba’s Verandah Cafe, a rambling old house with wrap around verandahs set in a lush garden. The morning I visit, the garden is buzzing with bird life and their birdsong – it’s crazily noisy. My Devonshire Tea is quite a spread and arrives on a two-tiered cake plate with a bunch of grapes and two hearty scones that are not long out of the oven. The whipped cream is lovely and thick, but the unique aspect are the toppings. The homemade mixed berry jam is rich and fruity but too chunky for me, but the pineapple and passionfruit butter is a smooth and fruity delight. The owner, Bev, tells me it’s her specialty. Before my visit I read many negative reviews on Tripadvisor about Bev’s manner. I don’t know Bev, and yes, her manner seems slightly gruff, but I think it’s just her tone and she doesn’t mean anything by it. However, I find her to be chatty during my visit, which takes me by surprise, as I am extremely wary after reading those reviews. 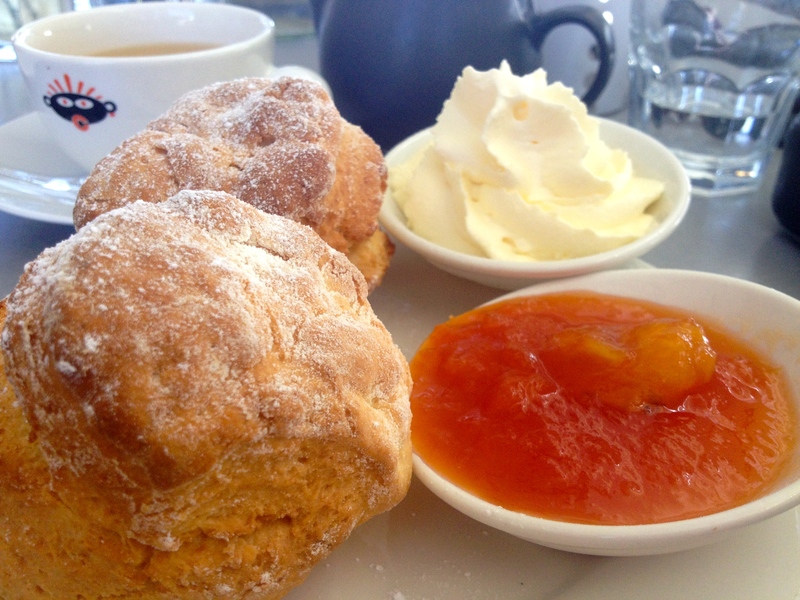 You’ll be doing yourself a disservice if you stay away and the Church café down the road doesn’t do scones! Tea: A range of Madura loose-leaf teas served in a plunger pot with a fine China tea-cup and saucer. I am also kindly offered a ‘top up’ of hot water. Overall: A truly superb and surprising spread. My affection for red rattlers or old train carriages started six years ago when I met my partner. He was (and still is) painstakingly transforming a red rattler into a future home and then eventually a holiday rental. Six years ago it was a vision, and now it’s almost a reality, and I am yet to find a carriage that matches the meticulously renovated one that now is part of my life. At the Red Rattler Gallery I peruse the pictures showing the before and after shots and follow the 1928 red rattlers story, which incidentally feels very familiar. The two carriages are parked parallel to each other and are linked by a timber deck, which is a wonderful outdoor dining area. One carriage has been transformed into a gift shop with the café kitchen at one end, while the other is a dining carriage decked out in booth-style dining. Alfresco loving diners are well catered for but the draw card here is certainly eating at one of the tables inside. I arrive late in the afternoon and manage to nab the last scone. It’s a shame as the scone is so good that I could have done with two! 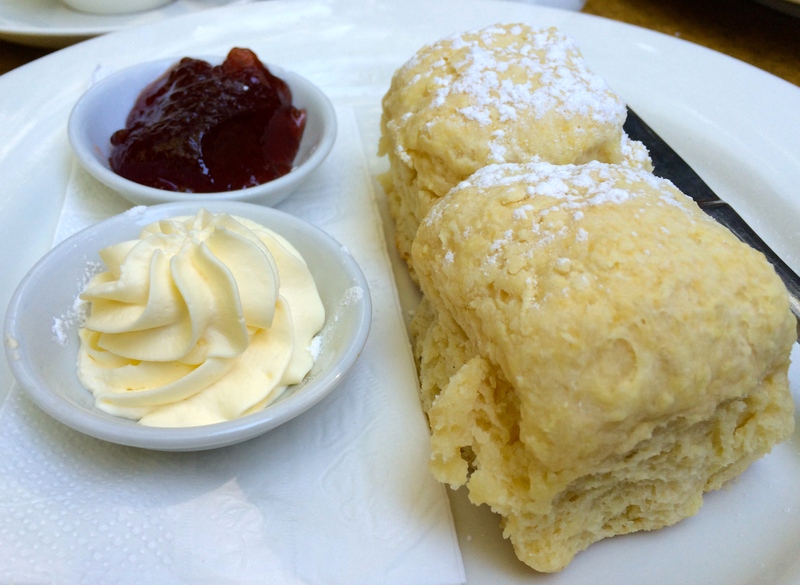 Although the scone leans heavily on the yellow side, it tastes incredible – light and fluffy with a creamy after taste. The jam is average and the cream is thickly whipped, and there are plenty of both. Open Wednesday to Sunday, but don’t leave your visit until too late in the day as they close up shop by 4.30pm even though the sign says 5pm or if they’re busy they can run out of scones. Also give yourself enough time so you can absorb the fascinating train features and atmosphere. Tea: A good range of loose-leaf teas served in a decent-sized teapot. Overall: What a place to have as your local café! Yes please! The highlight of any visit to Byron Bay is no doubt the coastal walk to Cape Byron Lighthouse. Passing some of the regions most expensive real estate, the walk along Clarkes Beach, through surf hotspot – The Pass, and Wategoes Beach, is an ideal way to approach Australia’s most easterly point. The views are undeniably spectacular, and depending on your timing it’s a viewing platform for migrating whales and pods of dolphins. If you can’t manage to rent the Lighthouse Keepers Quarters for a night or two, the next best thing is to spend a few hours at The Cape Byron Lighthouse Cafe – the views are mesmerising. 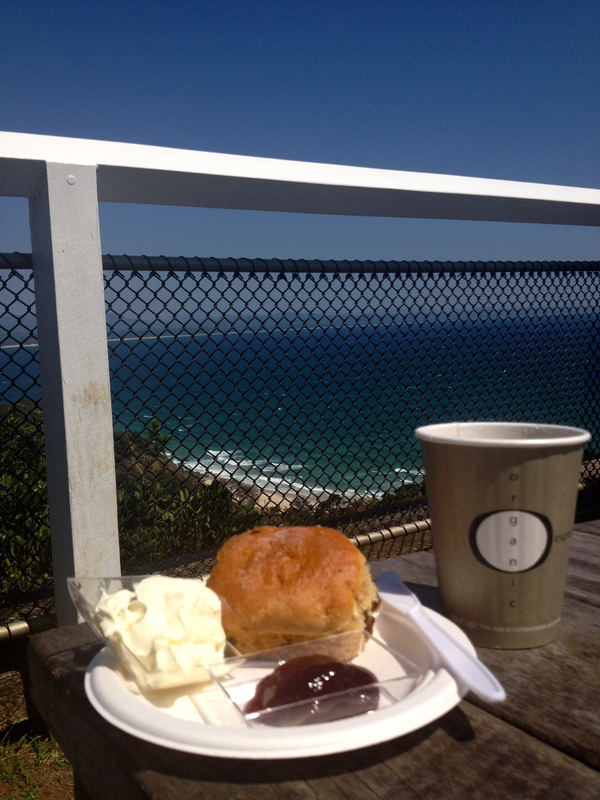 I can’t say the scones, jam and cream are a match for the million-dollar views. I mean really – paper cups, plate and plastic knife? The wholemeal dates scones are average, but I actually don’t mind them. My company, four discerning foodies, are not happy – way too microwaved is their unanimous reply. I, on the other hand, am more concerned about my initial serve (not pictured here) that came with one portion packet of jam and a squirt of can cream right onto the plate. At least the next few plates arrive looking a tad more decent, but it’s still the sweet synthetic cream sprayed from a can and the jam is still less than ordinary. The tea is also NOT Madura, like the tins on the shelf suggest. I even asked and was told it was Madura Estate tea (local) – clearly not by the look of the tag on my tea bag. Do go for the view, and try their other goodies. Tea: A few varieties of tea bags served in a take away cup. Overall: You can’t beat the magnificent view. What a cracker of a Devonshire Tea! 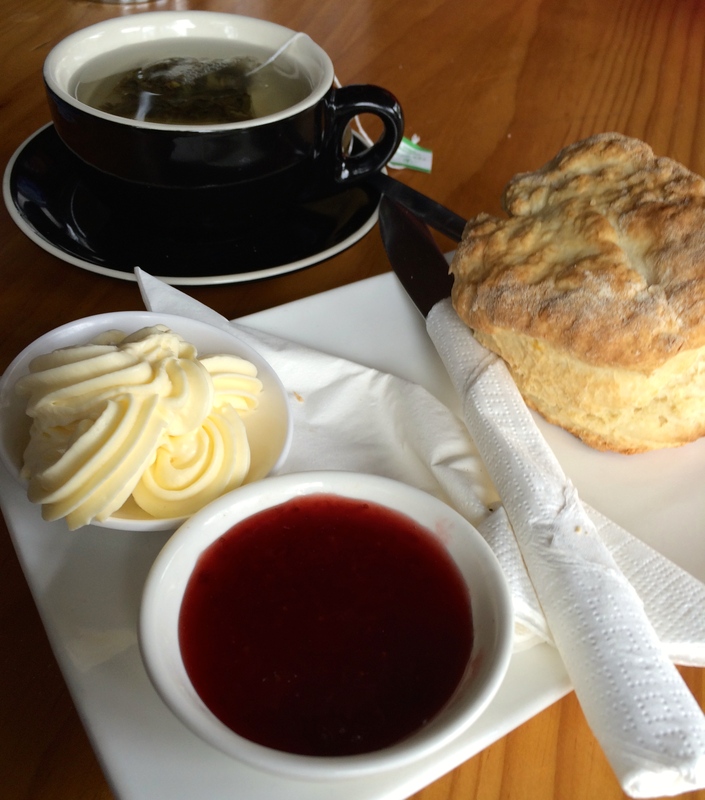 Who would have thought that you could find spectacular scones in downtown Grafton? The Jacaranda City is living up to its namesake as the violet hues of the Jacaranda trees dominate the streets. The small cafe is attached, by an inner connecting door not by ownership, to an antique store. I don’t see any scones, but the girl behind the counter assures me they are available, and at the same time asks me to choose a jam. There’s at least about eight or so different varieties on the counter, and I go with the raspberry. I am quite surprised about the forthcoming apology, they only stock tea bags rather than loose-leaf teas, its kind of sweet. While I wait, I take in my surrounds and notice that I am sitting at an old school desk that looks like its was sourced from my old primary school in the 1970s. My scone finally arrives, a delicate combination of fluffiness and slight crispness, and I’m annoyed that I only ordered one. It’s the sort of scone that’s perfect for a mid morning or afternoon snack and won’t interfere with your appetite for a more substantial meal later on. Wishing I had taken down the brand of the jam as it’s rich and fruity, and the cream is lovely and thick. This has gone straight on to my ‘top picks’ list! Tea: A few varieties of tea bags served in a small tea-pot that reminds me of Cadbury’s marble chocolate. Overall: A little cafe with a cool name tucked discreetly away from the main shopping area. The heritage village of Bangalow has come a long way in the last 20 years. Littered with cafes and stylish gift shops, the sleepy village has preserved its charm considering the region’s rapid rise to tourist mecca. Utopia Cafe Restaurant, housed in a heritage building with high pressed metal ceilings and timber floors, is decked out in mellow whites and shades of yellow. It feels very crisp, clean and spring-like and the kitchen uses the best local ingredients from the Northern Rivers region. 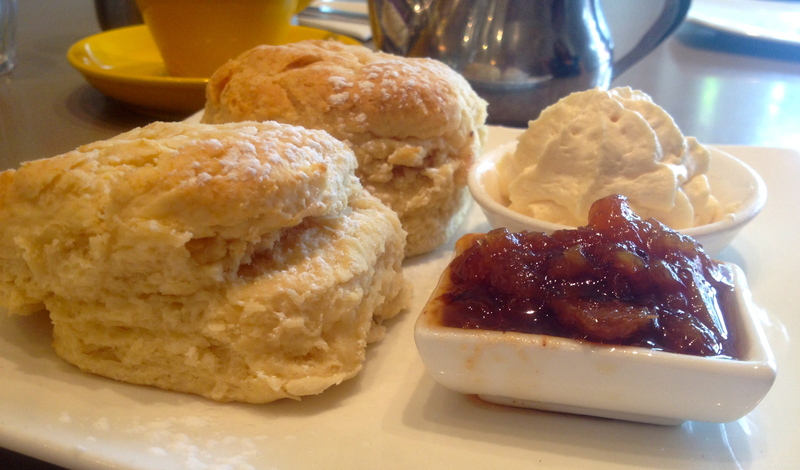 The scones are served singularly, so you can order as many or as little as you’d like, and if they are anything like the day I visit you may want to go for the plural as they’re soft and fluffy, the perfect scone texture and taste. The homemade peach jam is not only unusual but doesn’t taste sickly sweet and paired with the freshly whipped slightly sweet cream, is a match made in heaven. Tea: A few varieties of loose-leaf teas. Overall: A cool choice in charming Bangalow. Just north of Grafton and a short diversion off the Pacific Highway lies the cute and quiet village of Ulmarra. Hugging the banks of the huge Clarence River (I’ve forgotten how wide rivers are on the Mid to North Coast), Ulmarra is a delightful stop for a pause from behind the wheel. There are a few antique shops and second-hand bookstores but I think the real treat is a stroll along the banks of the Clarence river. The beer garden at the Ulmarra Hotel looks inviting as well. Situated in an unattractive building, compared to the strip of shops on either side, the Wide River Cafe has plenty of umbrella shaded outdoor seating out the front and just as much inside. 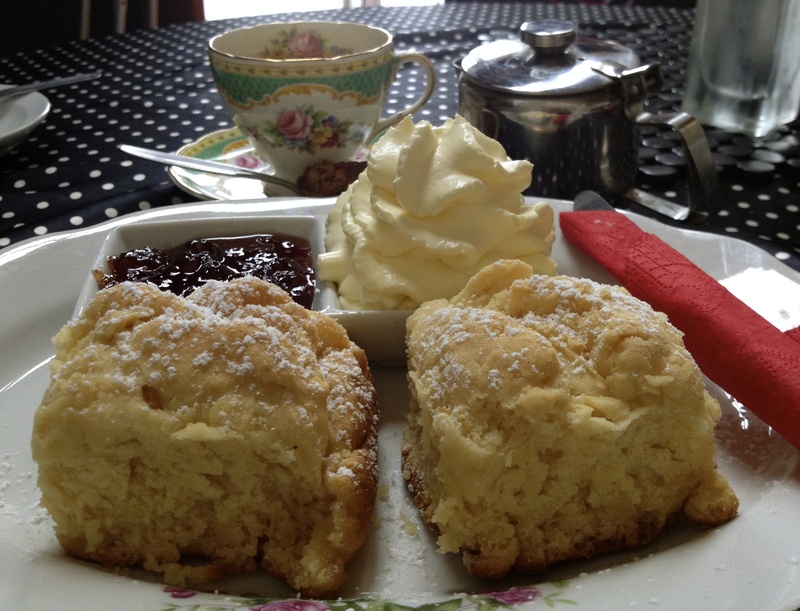 The cafe advertises ‘homestyle cooking’, and indeed the scones are such. The single scone arrives already jammed and creamed and although looks appetising is bland. The whipped cream is fresh but too light for me. As the mercury rises it could get quite hot in the front courtyard as there’s a lot of cement and the only shade is from the umbrellas. Tea: A variety of ALDI Diplomat tea bags. Overall: Cute village by the Clarence River. Thanks for the update on your DT at Moorland. I am doing a road trip up to Brisbane in April so I have a list of DTs to try, and Moorland is my first stop. I think I have one in Taree as well. Yes, tea is important too, but I guess some people don’t mind a tea bag or even an cheap quality tea. Enjoy the rest of your trip and let me know if you find anymore worthy DTs! Thanks for your comment. 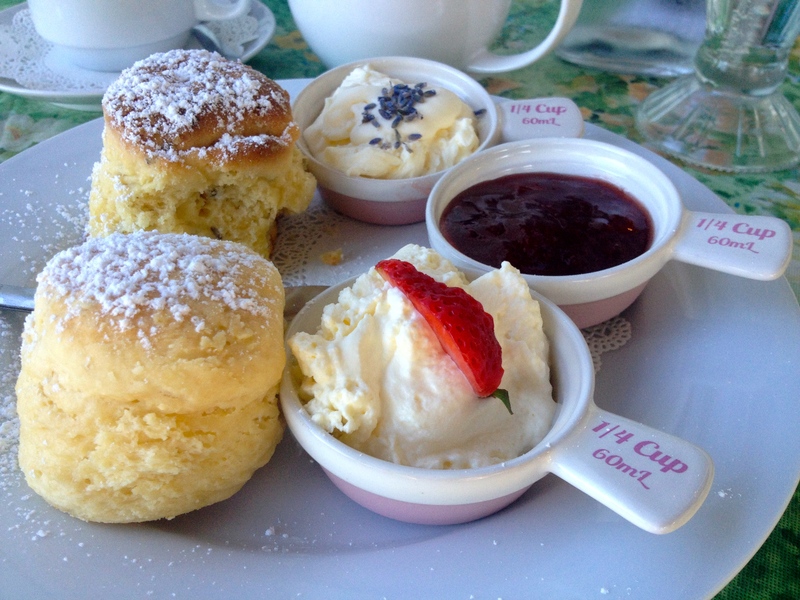 I am planning to drive to Brisbane next week so I can try some more Devonshire Teas on the way! Let me know if you have any recommendations.